What is BBC Music’s Biggest Weekend? BBC Music’s Biggest Weekend will see music come together on the BBC like never before across TV, radio and online! With over 175,000 tickets available to the public, it is a one-off music festival which promises to bring the nation together for a massive celebration of live music. BBC Music’s Biggest Weekend will take place on four sites, in four nations, across four days. Belfast, Coventry, Perth and Swansea are the four UK cities that will host the event on the May bank holiday weekend from Friday 25th until Monday 28th May 2018. There will be something available for everyone with concerts being hosted by BBC Radio 1, BBC Radio 2, BBC Radio 3, and BBC Radio 6 Music, plus extensive TV coverage across BBC One, BBC Two and BBC Four. Sets will be available on BBC iPlayer, mobile and online. BBC Music’s Biggest Weekend will showcase the range and diversity of live music on the BBC and will feature a line-up of incredible musical artists from the UK and around the world! Where is BBC Music’s Biggest Weekend taking place? Radio 1 will be represented at the events in Swansea, BBC Radio 6 Music at the events in Belfast and Radio 2 and Radio 3 will be heading to Perth & Coventry. All events will be outdoor, multi-stage music festivals featuring a range of artists. For full details of what’s happening at each location, including the latest news on the artist line-ups, please check out each city’s event page. 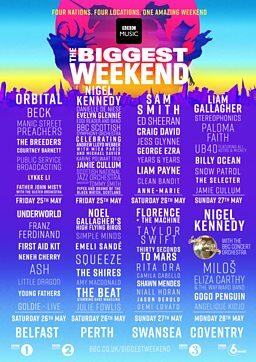 Who will be performing at the Biggest Weekend events? As with all music festivals, it is possible that line-ups may change due to circumstances beyond our control after tickets have been purchased. Please note, we are unable to swap tickets to alternative days, or cancel tickets and issue refunds should a particular artist not appear on the day as originally advertised.